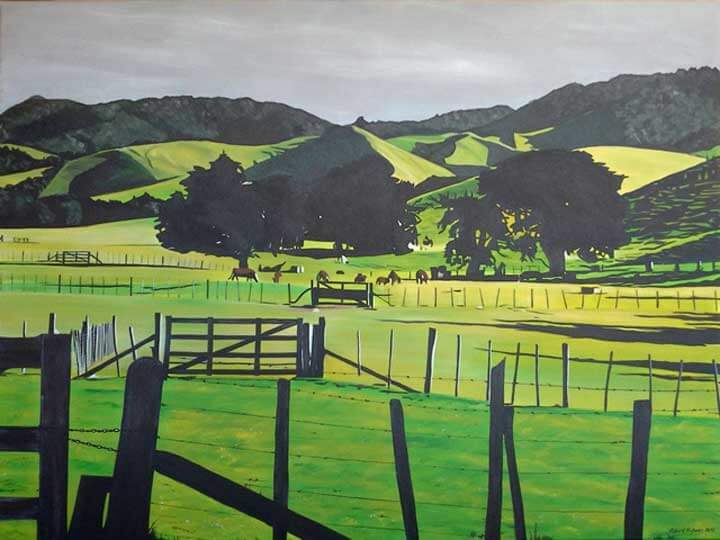 This painting is of Woolley’s Bay Farm, on the coast north of Whangarei, the bay before Sandy Bay. The view is with the beach behind, looking back west to the farm that boarders the beach front Road. It is a beautiful bay / valley that catches the light wonderfully on the flat foreground paddocks and the hilly ones beyond that lead to the bush block beyond. I have spent a few summer holidays on the beach front ,in an iconic NZ bach in this bay. I am pleased to have now put this familiar and fond landscape on canvas.